Another Asian bistro, really? What makes it different from the gazillion Chinese noodle places right around the corner, you ask? 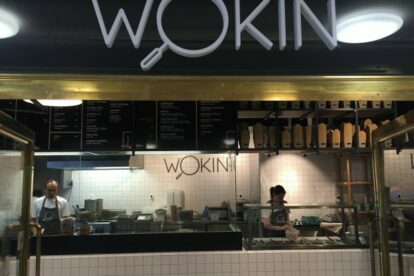 Wokin is a brand-new spot right beside the Quadrio shopping mall. The concept is simple – when you enter the well thought-out, rather minimalist designed interior, you’ll be faced with a choice. Or rather dozens of choices among different noodle and rice variations that you could be munching on in a matter of seconds. By breaking down the meal into individual ingredients you can make it as plain and simple or as decadent and extravagant as you want it. First, for the price of 65 crowns you can choose the base of noodles or fried rice with onions, carrots, cabbage, garlic and eggs. Then add from up to seven meat or tofu options and twelve vegetable toppings. Finally, pick from six sauces (I usually go for their trademark Wokin or peanut sauce) and six sprinkles on top. Student on a budget? Take simple noodles with one or two toppings and you’ll be a happy camper for less than a hundred crowns. If you go all in, prepare to spend about twice that. Me, I usually pick somewhere in between. So trust me and I bet the first time won’t be the last time you’ll wokin (bad pun intended). P.S: If you really want to eat like a local, have your lunch packed in a neat little box and drop by the #praguechairs at the nearby Piazzetta next to the National Theater.